A collaboration between winemakers and husband and wife, Kris Curran and Bruno D'Alfonso, who collectively have nearly 50 years of experience as winemakers. Together they produce Pinot Noirs from select vineyards in the Sta. Rita Hills AVA. 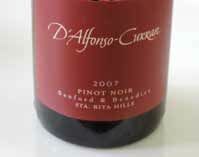 The D'Alfonso-Curran label is dedicated exclusively to vineyard-designated Pinot Noirs and Chardonnays. The Sta. Rita Hills Chardonnay and Pinot Noir blends are bottled under the BADGE label. Bruno started at Sanford Winery in 1983 and remained Sanford's winemaker for over 30 years. He spent his last few years developing his own BADGE label to showcase Pinot Noir and Chardonnay from the Sta. Rita Hills, and the DiBruno label consisting of Italian varietals. Kris grew up in the Santa Ynez Valley, obtained a degree in animal science at Cal Poly San Luis Obispo, and later graduated with a secondary degree in enology from California State University at Fresno. She started out as an assistant winemaker at Cambria Estate Vineyards and Winery, then Koehler Winery where she produced their first releases, and then Sea Smoke which became a huge success. In early 2008, Kris helped Foley's Pinot Noir program. Along the way, she started her own label, Curran Wines, in 1997, which offered Pinot Noir initially, but became largely devoted to Spanish and Rhone varietals. When she married Bruno, the D'Alfonso-Curran brand was launched. In late 2007, Bruno and Kris opened a tasting room in downtown Solvang at 1557 Mission Drive which is open daily from 11:00 to 5:00.